This island country is made up of over 1,100 islands, 200 of which are inhabited and 80 that are home to exclusive private island resorts. In total, the Maldives islands are spread out over 35,000 square miles of the Indian Ocean, making it most dispersed country in the world. So much so that the majority of islands are only accessible by boat, although the best resorts in the Maldives do often have a private seaplane. There are 26 atolls (groups of islands) in the archipelago, which are composed of sand bars and live coral reef. 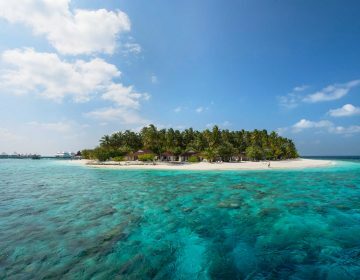 In fact, the Maldives is home to some of the most beautiful reefs in the world, with The Weather Channel listing it as number four in its list of The World’s 10 Most Amazing Coral Reefs. This is part of what makes holidays in the Maldives so magical. It are the reefs, the stunning crystal clear blue water, and the magnificent beaches that make Maldives holidays a must for everyone. One question that many often ask themselves before booking their Maldives holiday package is where exactly to start. There are so many different hotels to choose from, ranging from cheap guesthouses to luxurious 5-star all-inclusive resorts. What many don’t realize is that it is possible to take a Maldives cruise, which will give you the opportunity to visit numerous islands, see some of the top Maldives points of interest, and enjoy some of its best snorkeling and diving spots. There are many ways to cruise around the Maldives, from boarding a local dhoni to sailing around in an extravagant yacht. Before you book your Maldives cruise, here are a few things you need to know. A cruise around the Maldives is the best way to see numerous islands, visit different diving sites, and get around the picturesque island nation. It is the perfect way to explore the archipelago and spend time on some of the best Maldives beaches all on one Maldives holiday. Plus, it is fun! Especially if you go on a themed cruise, like one specifically for diving, snorkeling, or game fishing. If you just want to lay on some spectacular beaches, then there are cruises designed specifically for this. In short, whatever you are looking for in a Maldives cruise, it will not be hard to find. The Maldives are hot and sunny all year, although there is a time to go and not to go on a Maldives cruise. All in all, the best time to enjoy holidays to the Maldives is between November and April. These are the driest months of the year as well as being the least humid. This is also a great time to go on a cruise of the Maldives, as the water is clear, the sky is blue, and the weather is spectacular. If you are planning on diving in the Maldives, the best time of the year for a liveaboard is actually the wet season – May to November. The seas do tend to be a bit rougher, but this is when the mantas and reef sharks come out to play. Still, diving liveaboards can be enjoyed all year, but these months are the most recommended for diving in the Maldives. There are numerous boat options for your cruise around the Maldives. You can take a voyage on a dhoni, a yacht, a sailboat, or a ship. This is a traditional multi-purpose sailboat that is handcrafted using coconut wood. They are built without the use of plans by a master carpenter and his helpers. Today, many dhonis are made out of fiberglass, although you will still see some wooden ones floating around the Maldives islands. These vessels are fitted with diesel engines, though in the past they were sail boats. Most dhoris are built on Alifushi in Raa Atoll, taking around 60 days to complete. They are predominately used in the fishing industry, although many companies have converted dhonis in order to take visitors on cruises around the Maldives. Most of these are scuba diving liveaboards because of their low freeboard, though this is not always the case. Dhoris are small, having just six guestrooms that can sleep from one to three people. These are a little bit larger than dhonis, carrying anywhere from 18 to 22 guests. There are two or three decks on yachts, with rooms often being spread out on two of them. Yachts have a few added features that you often won’t find on dhonis, like a chill out room with a library, a chic bar, and a viewing area on the top deck. Yachts range from budget friendly to ultra-luxurious, which means that you can enjoy cheap Maldives holidays while traveling around on a cruise. 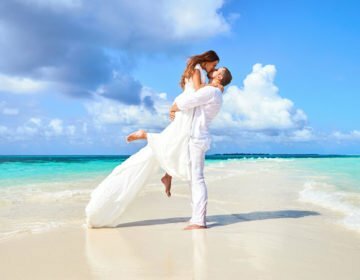 You can also expect the complete opposite end of the spectrum, going on a Maldives cruise with all of the luxuries you would find in many Maldives luxury resorts. There are not many of these around, as most sailboats have been replaced by motorized ones. But it is still possible to sail around the Maldives islands with masses blowing in the wind, leading you along the way. 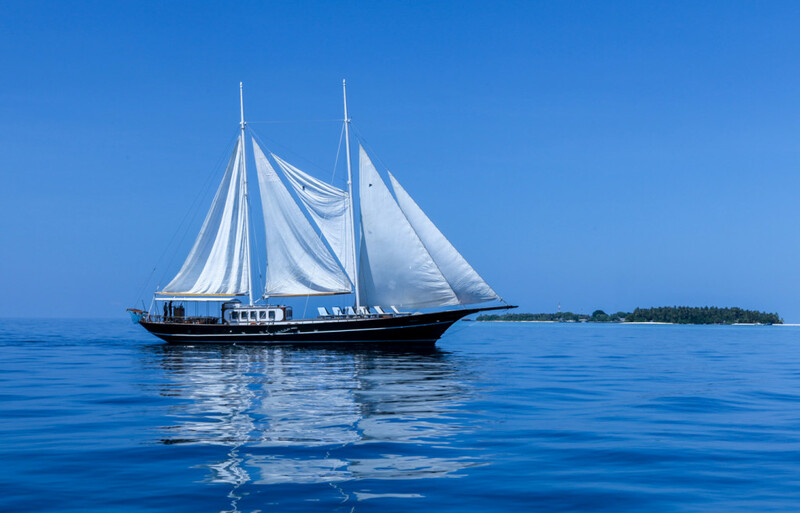 Most sailboats that offer cruises in the Maldives are catamarans with both engines and sails, though there are a few typical sailboats that offer voyages around the islands. Sailing is a slower way to cruise the Maldives, but it is also quite thrilling. It will bring you back to a time before there were engine boats, but with amenities and luxuries anyone would expect on their Maldives holiday in this day and age. Most sailboats have six double-cabins, though there are smaller four and eight cabin boats that cruise around the Maldives. These are bigger than the others, sleeping upwards of 20 guests. 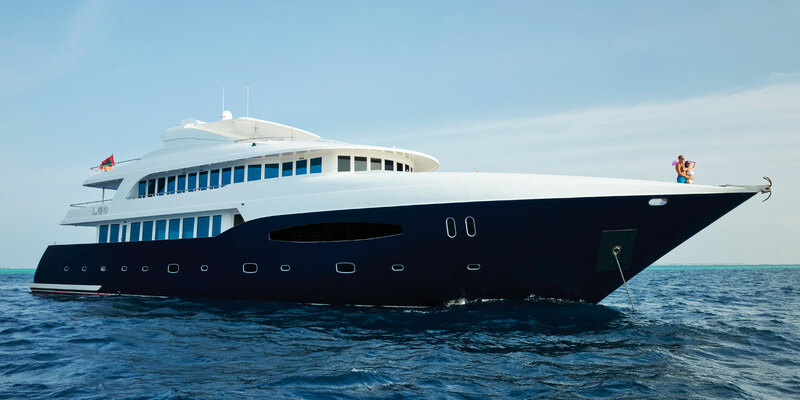 There are even ships that sleep up to 40 guests, offering both suites and cabins. Ships are great if you want to meet lots of people while cruising the Maldives. They have an open upper and lower deck where guests can relax and enjoy the sun, and the views of the archipelago. Rooms and suites are available, and are on different decks of the boat. There are many dhonis, yachts, sailboats, and ships that cruise along the Maldives, stopping at various islands and dive sites while traveling along the beautiful water. So many that it is hard to decide what Maldives cruise is the best one. We have made it a bit easier for you. These are our choices for the best Maldives cruises. This is literally a luxury resort on a yacht, with all of the trimmings. 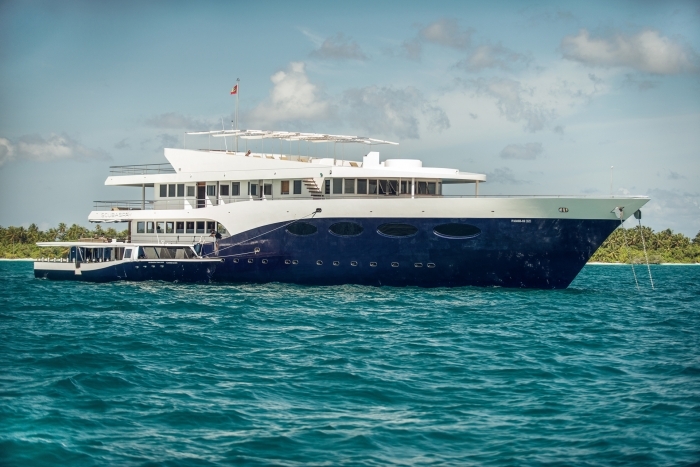 The Four Seasons Explorer is an impeccable experience, bringing all of the comforts of their 5-star resorts onto a three-deck yacht. Take a two-, three-, or four-night cruise, sailing between their two fabulous resorts; Kuda Huraa and Landaa Giraavaru. Opt for the seven-day cruise and do the Circuit Cruise, sailing from Kuda Huraa to Landaa Giraavaru and back in a loop. The Four Seasons takes you on a mesmerizing cruise around the Baa Atoll UNESCO Biosphere Reserve to secluded dive spots, unexplored reefs, and deserted beaches. The entire time you will be pampered as if you were in one of their resorts, enjoying everything from gourmet meals to spa treatments. As soon as you get onboard the boat you will be in awe, what with its sun deck, diving deck, fabulous restaurant, indoor lounge, and bars. The accommodations are just as impressive, or maybe even more so, especially the Explorer Suite and its panoramic views, full bath tub, and walk-in wardrobe. Even if you stay in a State Room you will be surrounded by contemporary furnishings and natural light. Each and every cabin has an iPod docking station, Plasma TV, WiFi, cotton bathrobes, and down duvet. Plus, the service onboard is exactly what you would expect of anything with the Four Seasons name. This is the best choice for divers that want to go on an exceptional liveaboard. Scubaspa really is the ultimate experience, what with its gym, Jacuzzi, and gourmet cuisine. They even offer yoga lessons and spa treatments, and have an open-air cinema. You can enjoy a cocktail on the deck watching the sunset or after dinner, gazing up at the stars. It is an award-winning dive resort that floats right on the water, taking guests to dives sites all over the Maldives. But you don’t have to be a diver to go on a Maldives cruise with Scubaspa, as they also cater to non-divers. The accommodations are arguably the best part of the ship, which can accommodate up to 40 guests. 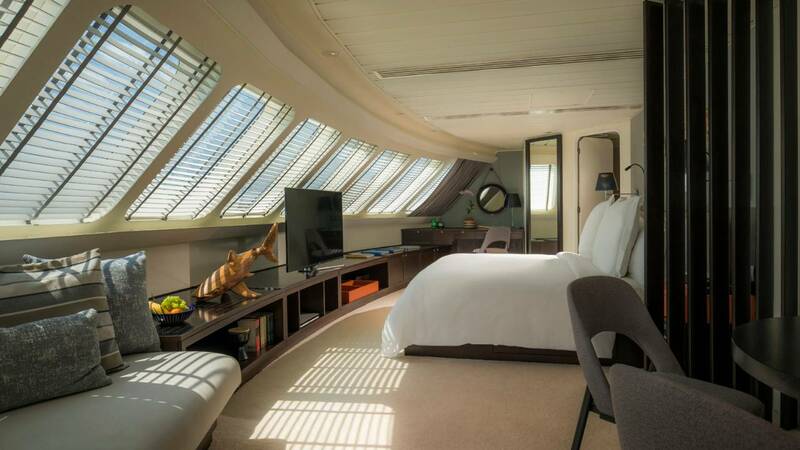 The Manta Suites are the premier suites onboard, complete with a sitting area, and spectacular panoramic views. Dolphin Suites are best for couples, as they are equipped with a queen-size bed and oval panoramic windows. These suites are on the main deck, while their extremely cozy cabins are on the lower deck. If your dream is to cruise around the Maldives in a traditional dhoni, than G Adventures Maldives Dhoni Cruise is the best Maldives cruise for you. This seven-day cruise leaves from and return to Mali, passing through the Malé Atoll, Felidhoo Atoll, and Meemu Atoll, making stops at local villages along the way. On this cruise you will go snorkeling in the reefs, spend time on some picturesque beaches, and enjoy an evening of traditional folk music. The dhoni isn’t luxurious, but it is very comfortable, and is great for solo travelers wanting to meet other people. It’s also great for people that are looking for a cheap Maldives holiday alternative, as it gives you the chance to see many of the Maldives islands all on one vacation, with all transportation and meals included. 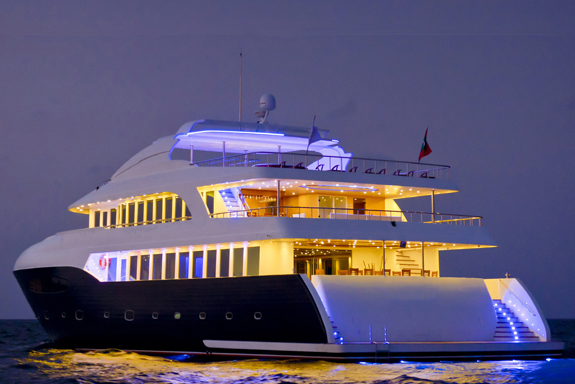 In 2014, the Liveaboard Association of Maldives voted this as the best built liveaboard. This 42 meter long boat features two outdoor Jacuzzis, three decks with sunbeds, a communal lounge with a 65 inch TV, and a disco room with Karaoke. WiFi is available everywhere on the ship and runs for 24 hours a day, as does electricity. The Maldives Blue Force One has two routes; the Central Atolls Classic Route and the Southern Hemisphere. The Central Atolls Classic Route is one of the most traveled routes for Maldives cruises, sailing around the North and South Male Atolls, Ari Atoll, and Felidhoo Atoll. This week long voyage runs from August to May, taking guests on a search for black-tip sharks, white sharks, dolphins, pelagic, and mantas. 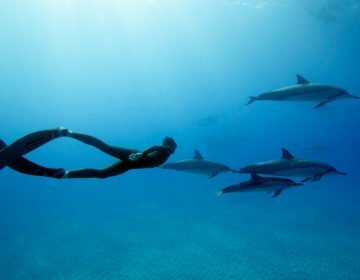 The Southern Hemisphere journey only runs for eight-weeks a year, traveling to the best dives sites in the Maldives. You will go on three dives a day, in addition to enjoying at least one night dive. This seven-night voyage leaves from the Hulhule Island Resort and goes on a journey through the South Male’ Atoll and South Ari Atoll, stopping at some magical places along the way. You will get the chance to go snorkeling, swimming, and kayaking, as well as visit some stunning beaches. The catamaran makes a stop at the Dhigghiri Island, Alikoi Rah Sand Bank, Daghetti Island, and Guraidhoo Island. The boat also goes on a 10-night journey through the Goidhoo Atoll, Baa Atoll, South Ari Atoll, and North Male Atoll. Maldives Dream is a small boat with just six cabins, two of which can sleep three people. All have a private bathroom and air-conditioning, with all meals being included. It’s not luxurious, but it’s a fantastic boat and an incredible way to explore many parts of the Maldives.